To say that the situation of people with disabilities in Poland is difficult is an understatement. Featured image by Jakub Szafrański. 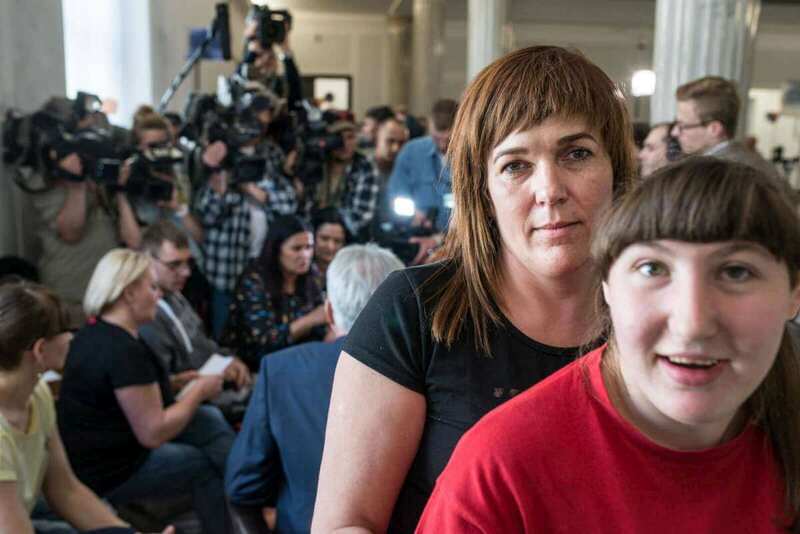 “After 40 days of struggle for the dignified life of our children with disabilities, after 40 days of humiliation and contempt on the part of the government, we suspended the protest” said Iwona Hartwich during a press conference on Sunday afternoon. A few minutes earlier Mrs Hartwich, her disabled son Kuba Hartwich, and several other people with disabilities and their parents, left the Polish Sejm. They spent previous 40 days protesting inside the building of the parliament. They were met by crowds with huge “Thank you” signs, cheerful chants and flowers. They spent previous 40 days protesting inside the building of the parliament. Kuba Hartwich has cerebral palsy, needs a wheelchair to move around and suffers from glaucoma. He belongs to a group of 272 hundred thousand Poles who due to their disabilities cannot live by themselves and work. Mr Hartwich receives PLN927 a month (it is less than 225 euros). The PLN153 of it (less than 40 euros) is the “extra care allowance” available to all people with disabilities. Additionally, he receives PLN774 (around 185 euros) of social allowance – this benefit is available only to people were born with disability or who acquired their disability before turning 18. It is less than the benefit for people who are permanently unable to work (PLN1030, around 240 euros) – but this one is available only to people who have paid their social security contributions before their acquired their disability. Mr Hartwich and people like are therefore ineligible. Families like the Hartwichs are in a dire situation. If Mr Hartwich were not an adult, he would be entitled to additional PLN1407 monthly (about 350 euros). This allowance, however, is available only for people who have not turned 18. He is 22 so he does not receive a dime, although his disability did not magically disappear on his 18th birthday. Families like the Hartwichs are in a dire situation. The state does not provide material benefits – there are no qualified social workers or nurses who can provide care. This duty, without any compensation, is borne by the parents, usually mothers, who perform the labor of care. Less than 225 euros have to cover the expenses related to disabilities, like diapers, lotions against bedsores, or any other medications or equipment – this on top of regular life expenses. Thus, Mr Hartwich spends his money on basic needs like food but not shoes – he cannot afford them. Unsurprisingly, he cannot afford rehabilitation either. One-hour long session costs around PLN100 (around 23 euros) and he should have them 5 times a week. It makes it PLN2000, more than twice as much as he receives. Because of his glaucoma, Mr Hartwich has to travel to see a doctor to another city, as the required equipment is not available in his native Toruń. The visit costs PLN300. Plus the costs of transportation. Thankfully, the eye drops for glaucoma are not expensive. It would not be enough even for a person without disability to pay the rent and bills. They have two main demands. One was to increase the social allowance – the already mentioned PLN774 per month – to the level of lowest benefit for those who are permanently unable to work (240 euros at the moment). This one has been met. Additionally they are demanding the introduction of the rehabilitation allowance of PLN500 (about 120 euros). Rehabilitation allowance, however, is kind of a misnomer in the context of such dire needs. “I will spend it on food, basic life needs, rehabilitation” says Mr. Hartwich. “It is about social minimum,” he explains. Yet this demand was denied by the government. The situation of people with disabilities has notoriously been ignored by the previously governing Civic Platform (PO). Iwona Hartwich has been fighting for changes since 2009. Then she protested in front of the office of Prime Minister demanding the raise of the extra care allowance. In 2011 parents of children with disabilities protested again. And again in 2013. Each time they heard the same response: the allowance would be increased in the next five years but it remained unchanged till today. In March 2014, in an act of desperation, Ms Hartwich and others decided to protest in the parliament. PO was forced to give in and negotiate and the protest was suspended. One demand was met, other were supposed to be worked out by special committees however with the parliament in recess over the summer the issue was conveniently forgotten. Iwona Hartwich has been fighting for changes since 2009. Then on its part, PiS, in opposition at the time, didn’t miss the opportunity to criticize the government and present themselves as allies of the protesters. “They were coming and having teas with us, shook our hands, gave us blankets to sleep on” Ms Hartwich recalls with acrimony. “They were whispering to our ears: vote for us, we will change your situation. I was tricked,” she bitterly admits. When the PiS took power in 2015, Ms Hartwich and others hoped for a change. They had new demands, this time focusing mostly on their already adult children with disabilities. “We were coming to the meetings, we were sending letters, we were ignored,” she says. “After two and a half year of futile of asking and requesting we were done. Other women and myself were sitting in my living room and decided to resume the protest in the parliament,” says Ms Hartwich. 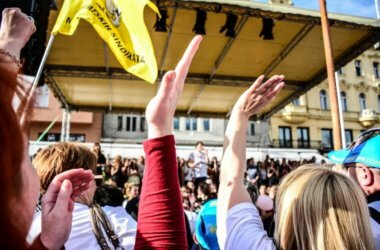 The protest started on April 18th, after a press conference held in Sejm. The protesters’ passes were sponsored by Joanna Scheuring-Wielgus, now an independent MP. “They called my office and asked for a meeting,” explained Scheuring Wielgus. “After a talk we had I promised I would organize a press conference for them. I didn’t know they would stay in the parliament to protest, although I saw their determination,” she added. “We would get up, wash ourselves, talk, support each other, sometimes have meetings, sometimes give interviews, and in the evening we would go over our day and discuss it,” Kuba Hartwich recalls his regular day during the protest. “To be honest, I did not expect that we would be there so long, we hoped for a faster resolution and a different outcome” – says Kuba Hartwich. And they were not prepared. They had only bare necessities with them: few t-shirts, a change of underwear and basic cleaning products. They slept on the blankets they received, like before, from the opposition MPs. “Ms Joanna Scheuring-Wielgus did our laundry,” says Iwona Hartwich. I did not expect that we would be there so long. The prime minister Mateusz Morawiecki, minister of labor and social policy Elżbieta Rafalska, president Andrzej Duda, also from the PiS, visited the protesters and urged them to finish the protest. Yet the government refused to meet the demands. At some point minister of labor Rafalska presented a “compromise solution” which raised the social allowance to the requested amount but instead the demanded PLN500 the Ministry offered priority lines to some doctors and in pharmacies. The protesters immediately rejected the proposal, saying that not all people with disabilities need instant assistance, but all of them need money. “Kuba still cannot afford shoes,” Ms Hartwich comments. Meanwhile a number of right-wing internet trolls kept insulting the protesters online, while verbal abuse and thinly veiled threats of violence came also from the members of the ruling coalition. Jacek Żalek said that children in this protest were used as “human shields” and “hostages” in pursuit of special interests. Bernadetta Krystyniak, echoing (intentionally or not – it does not matter) the infamous Stalinist saying stated: “I would find a statute against these parents.” Marek Kuchciński, the speaker of the Sejm, suggested that they pose an “epidemiological threat.” Krystyna Pawłowicz from PiS and professor of law at the University of Warsaw, known for her harsh language and unconventional grammar and orthography, tweeted about “unbearable stench” in the areas of Sejm occupied by the protesters. The only sympathetic words on the government’s side came from the vice-minister of justice Patryk Jaki. He said that “in the merits of the case, they are right.” Jaki is running for the mayor of Warsaw perceived as an anti-PiS stronghold. Verbal abuse came also from the members of the ruling coalition. The decision to suspend the protest came after on Friday the Marshal’s Guard, official security of the parliament, manhandled the protesters when they tried to open the window and display a banner. Pictures of bruised arms of protesting women circulated on the social media. “We were concerned for our safety and, more importantly, safety of our children,” Ms Hartwich explains. The manhandling on Friday was the most brutal event in the long streak of humiliation the protesters experienced since they began their protest. 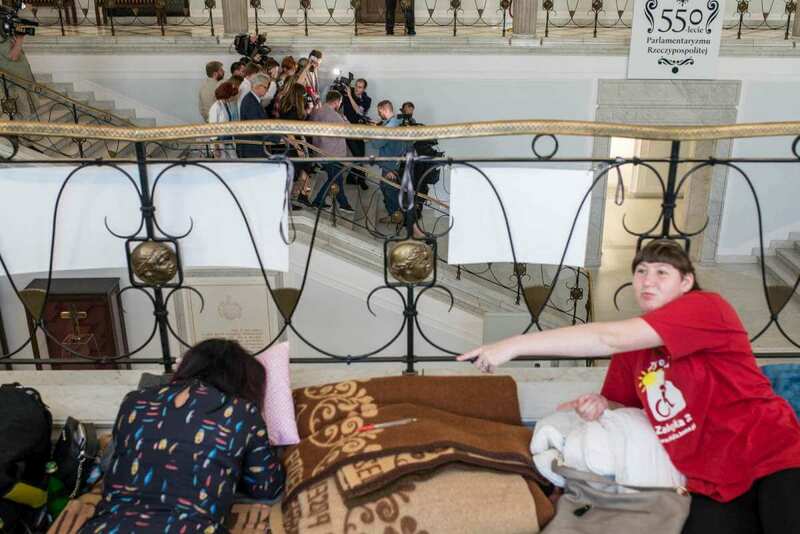 The protesters were prohibited from leaving the building, then from using bathrooms, and finally elevators for people with disabilities. Although only one of the demands was met, Kuba Hartwich says that this protest was not a failure. “We have won the raise of the social allowance,” he says. “More importantly, we have made our struggle and our issues visible,” he adds. It is hard to argue that. Their struggle was a hot topic of the main dailies and in the prime time news cycles of the main TV stations for several weeks. They spoke with their own voices and their own words about their own experience. 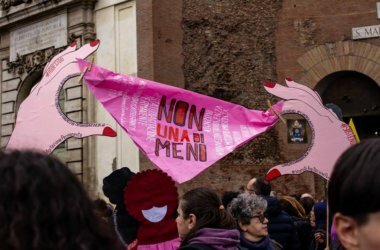 New alliances have been forged: feminist organizations were one of the main supporters of the protesters. And there are opportunities for more articulations like this one due to the fact that the current government has antagonized multiple groups. Representatives of the opposition parties signed a Solidarity Package with People with Disabilities initiated by Ms Scheuring-Wielgus. Although there are hardly any chances of implementing it this term, the Package symbolically binds the signatories to meet the PLN500 demand and few others once the opportunity arises. Moreover, the unfulfilled demand has almost unanimous support of Poles – according to polls, 90 percent of society is in favor of granting the requested PLN500. One is tempted to add, that PiS has shown that its pro-social face was just a mask. The benefits have been used not to improve the situation of those in need but rather to use as a carrot which together with the stick of deprivation and criminal prosecution is used to create clientelistic dependence among vulnerable groups. The struggle is not over. “The new statute goes into effect on July first. We will take advantage of all its provisions and we will demand to set the specific amount for the social minimum for families with people with disabilities who are incapable of independent existence. And then we will demand allowances that meet this sum,” confidently says Ms Hartwich.